Asset-liability management (ALM) is the cornerstone of our investment philosophy. Premiums generated by our underwriting activities are invested in assets whose cash flows match the durations and currencies of our re/insurance liabilities, to meet future claims and benefits. As a result, we invest more in higher-quality fixed income securities with stable long-term returns. 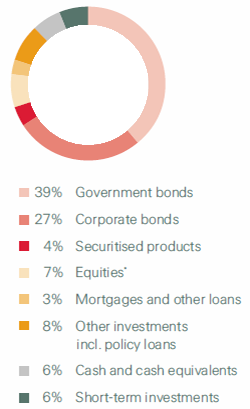 At the end of 2015, such investments accounted for 73% of our total assets under management1. Swiss Re is committed to investing its assets responsibly via a controlled and structured investment process, integrating environmental, social and governance (ESG) criteria. We believe that considering these factors can have a positive impact on the long-term financial performance of our investment portfolio. Thus, we apply sustainability-related risk information consistently across our entire investment portfolio. 1 Asset classes considered consist of government bonds (including agency), corporate bonds, securitised products, and mortgages and other loans.